Home > Products > Ear Plugs > Ear Plug Assortment Packs > Foam Ear Plug Trial Pack: Just the Largest! Foam Ear Plug Trial Pack: Just the Largest! Foam Ear Plug Trial Pack: Just the Largest is designed to help those who need a larger than average ear plug to find one that works best. We have chosen from more than 50 different foam ear plugs, those with the ability to fit people with larger ear canals. If you usually find the plugs you try to be too small, this trial pack is exactly what you need. 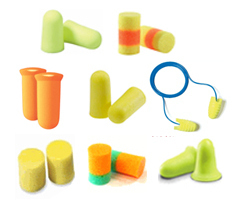 This pack includes one pair of each of the following ear plugs. Foam Ear Plug Trial Pack: Just the Smallest! Product Reviews for Foam Ear Plug Trial Pack: Just the Largest! Foam Ear Plug Trial Pack: Just the Largest!5BobFebruary 25, 2017My wife is still experimenting with the different ear plugs. She has already found 1 that works, but looking to see if any others are better. Also the customer service people on line and on the phone are very helpful and knowledgeable of thei products. VERY satisfied! Foam Ear Plug Trial Pack: Just the Largest!5Dale DemeulesMarch 18, 2016Buying the trial pack is a great way to find out which ear plugs fit the best. I had tried several brands ever since Heroes changed their ear plugs which were useless. I found the perfect repllacement in the trial pack.